We had a very special birthday here in the last week. My little baby turned one. It was kind of a big deal, so naturally I threw an equally fitting party for the occasion. I decided to go all handmade for her party decorations instead of buying mass produced party supplies. It seems I've caught the crafty mummy bug now that I actually have time to make stuff (thankyou extended maternity leave). I didn't realise how creative I was until I decided to make the goodie bags myself, so I thought I'd share my little foray into crafting for others who are interested in going the DIY route as well. Naturally we went with an owl theme, with a colour scheme of pink, purple and a hint of blue. Coincidentally they're the colours of hootabelle, but I also thought they were a nice balance between boy and girl colours given the party guests were equally split with girls and boys. I did different bags for the younger and older kids so I wanted all the bags to be labelled so they didn't get mixed up. I came up with my name tag design within an hour based on what was available at the shops on the day I went hunting for supplies. 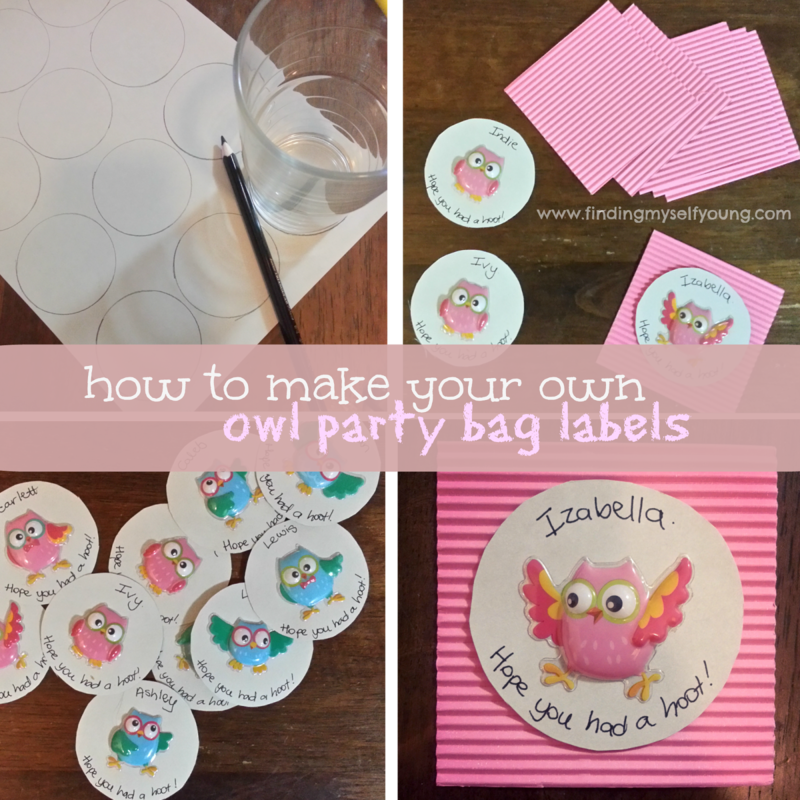 Mind you I had been researching owl party ideas for a few weeks before so my name labels were loosely based on this tag I found on pinterest. Ok so they look nothing like that tag, but that's where I got the circle with a backing piece idea from. I got all my supplies from two local junk shops so they didn't cost me too much to make which is always a plus. All up it cost me roughly $9 to make 12 name labels and I still had supplies left over. First I made the circle shape on the card. 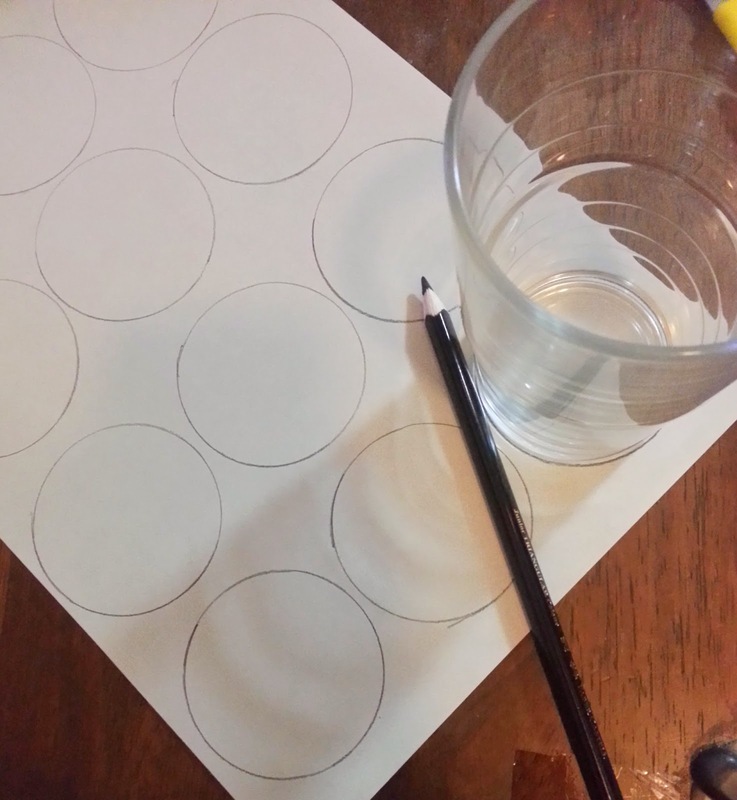 As you can see I did this in a very technical way by searching my house for something circle that was roughly the size I wanted. I used the base of a glass. 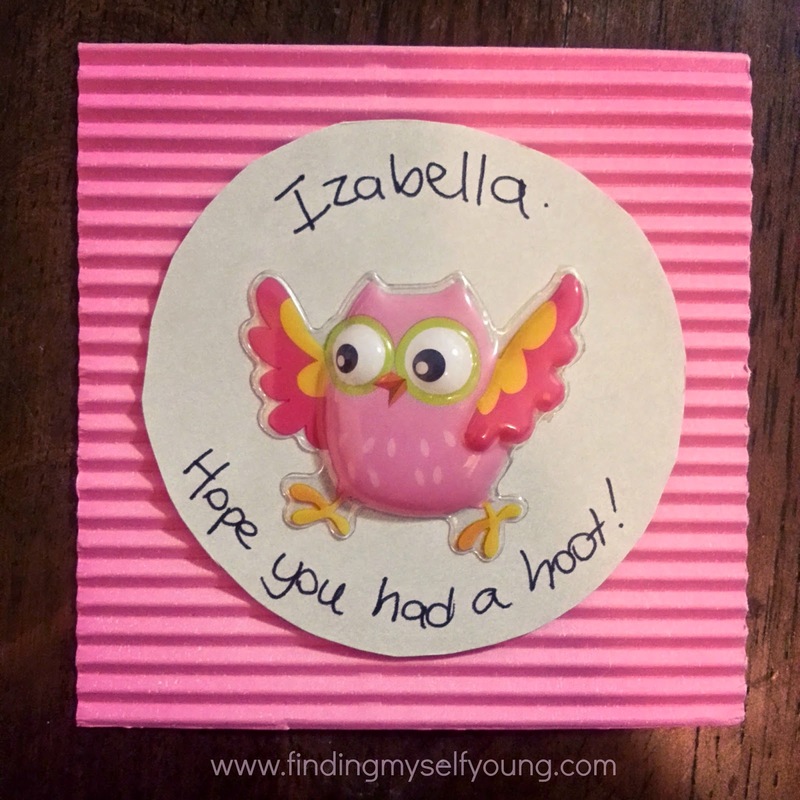 Then I stuck an owl sticker in the center and wrote the name at the top and "hope you had a hoot" across the bottom. You could change it to a different slogan for different party themes or simply stick with "thanks for coming". I cut the card into 8cm x 8cm pieces which fit nicely onto my bag size. I bought a pack of coloured card pieces thinking there would be pink and blue card in there, but there was no blue, so I went with pink for girls and green for boys. Not having blue made my ocd go into overdrive, but I think the green still matched enough as the owl wings on the boys owls were green anyway. To assemble I used 1mm square double sided sticky foam pieces to stick the circles on the card. The goodie bags were relatively easy to put together. I simply used a pack of white paper bags from the junk shop, drew and stuck on a washi tape bunting and then stuck on the name labels with more double sided sticky foam. The hardest part was the washi tape bunting, but only because it was a lot of fiddling around measuring and cutting the tape pieces. But it looks awesome, right? I matched the washi tape bunting with the bunting I made for the cake (more to come on that in a later post). I know I could've gone down a much cheaper route when it came to the contents of the goodie bags, but I didn't want to fill them with useless items or food that would be eaten by the parents. You see the majority of our guests were one or under so I didn't want to put lollies or chocolates in the bags as some of them wouldn't be able to eat them. I hear all the parents sighing that they won't get chocolate, but don't worry the parents had a lolly buffet so they didn't miss out on their lollies! Instead I tried to think of items that were small enough for a goodie bag and yet suitable for one year olds. 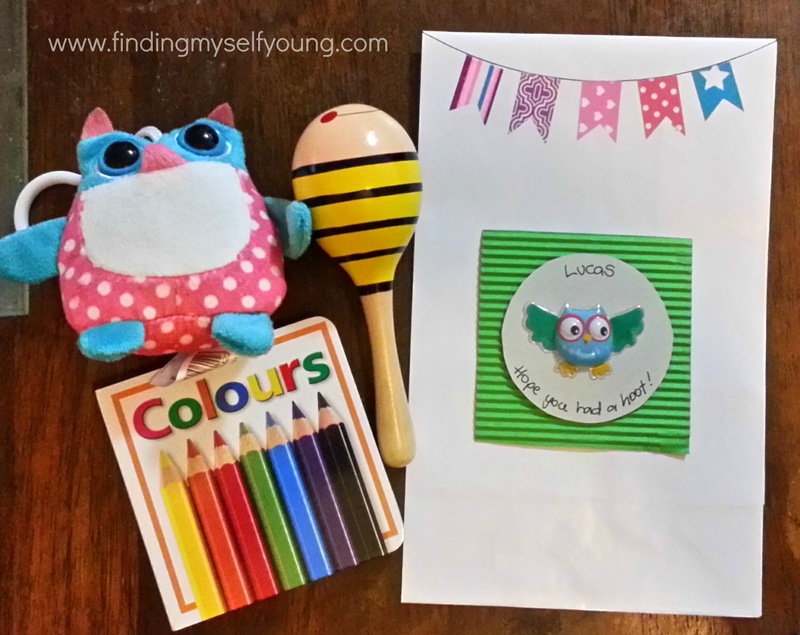 After extensive brainstorming and asking my wonderful facebook followers for ideas, I came up with: a board book, a maraca and a cute little owl toy. For the few older kids I substituted the maraca with a my little pony toy. The board books were in a pack of 8 at Kmart for $10 and the owl toys were $1.50 each, also from Kmart. The maracas I purchased in pairs online from Red Berry Kids for $7 a pair. The my little pony toys were $2.50 also from Kmart. So there you have it, this is just one part of the birthday party puzzle that I've spent the last few months researching, dreaming of and making. More to come on the rest of the party in a later post. 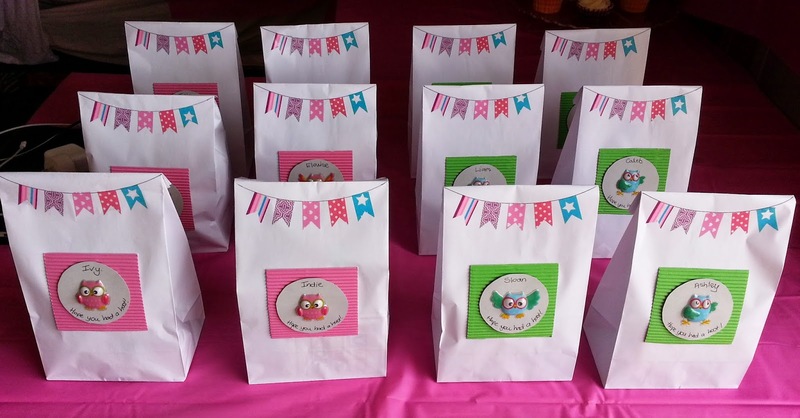 Have you ever made your own party bags? Linking with Grace, Mandy and Sonia. You are such a great party host! You could seriously do this for a living! Gorgeous! Haha I don't know if I'd want to do it more than once a year! You are so creative - such a cute idea and easy. I really surprised myself Trish I had no idea I was creative at all until I started planning her party. Wow these are very generous and clever party bags. Great labels! Have a great weekend! 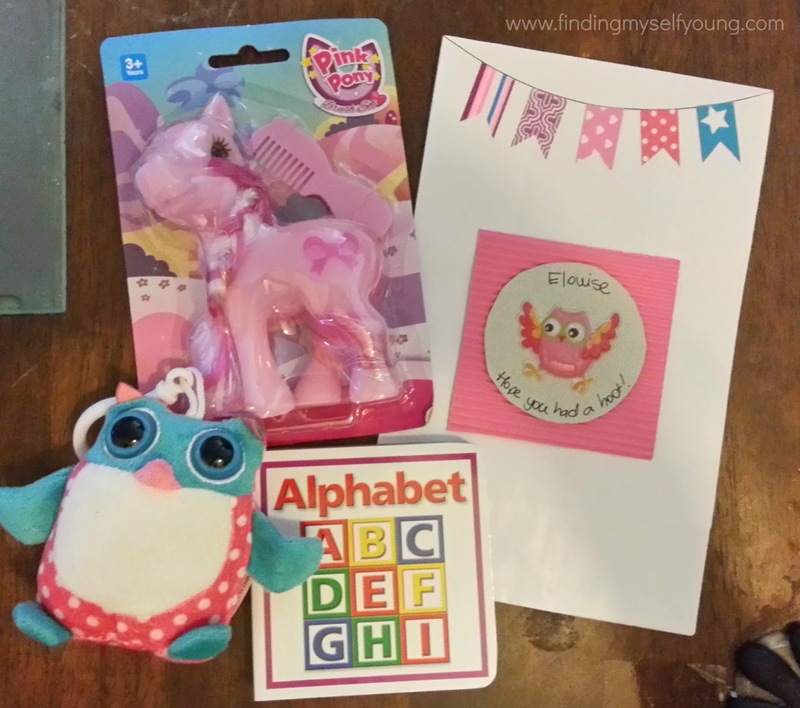 I can't wait until shes old enough that I can buy all the $2 party favour stuff lol. All the cheap stuff is for 3+ damit. G'day! Thanks for stopping by our #SayGdayParty! Cute idea! Please remember to stop by and comment on other people's submissions too and of course, hope you are following Natasha and me on Pinterest! These are so cute! Love that they are filled with items that kids will actually use instead of just getting tossed. Yep that was my main aim with the contents, I wanted to make sure it was all useful and age appropriate. Oh, that's just gorgeous, Toni! You'v inspired me to make my own party bags for the boys next birthday. Such cute owls! That is so fabulous! You must have been so proud of yourself!! Yep just quietly I was super excited with how they turned out. I remember when I was young they were just a freddo frog and a balloon, seems they've become a MUCH bigger deal these days. What an awesome job you did Toni. These look fantastic. Nice! I am going to do exactly like this for my niece’s birthday party. My sister was always using some random colored bags for the kids but this is an interesting idea. Also, because I like art and craft a lot. I displayed some of my work in an exhibition that took place in an event space Chicago last month.